As I was prepping up for the Spookathon (a Twitter read-a-thon and post will be coming out soon), I sat blankly staring at the computer screen contemplating what books I could read. Low and behold the power of the internet saves me from another dilemma! Simply, I typed up Pride and Predjuce and Zombies to find books similar to it. I discovered there was a prequel! I was so excited. I was jumping for joy in my little seat! Dawn of the Dreadfuls by Steve Hockensmith is the prequel taking place four years before Pride and Prejudice and Zombies by Jane Austen and Seth Grahame-Smith. For readers of Pride and Prejudice and Zombies, this is a nice introduction to how the zombie plague began. 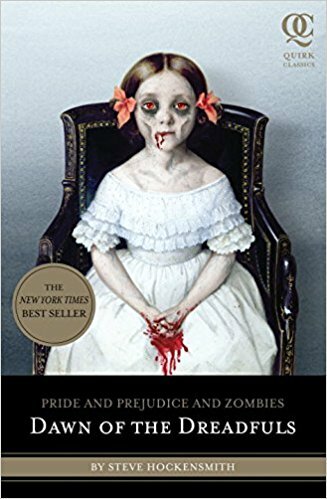 For people who have never read, Pride and Prejudice and Zombies is a mashup combining elements of Jane Austen’s classic novel Pride and Prejudice with elements of zombie fiction. The Bennets realize the zombie plague that disappeared years ago reemerges at the funeral of Mr. Ford, who comes back as a Dreadful, the term used for a zombie. At the moment of Mr. Ford’s resurrection. Oscar Bennet has realized his folly in not teaching his five daughters: Jane, Elizabeth, Mary, Lydia, and Kitty, the art of the warrior. As he teaches them for a few days, a mysterious stranger comes and trains the Bennets in the art of the warrior. Increasingly through the book, more zombies keep poping up everywhere. The increasing presence of the zombies accumulates to a large scale invasion of them. The sheer number of them causes Mr. Bennet realize their return has been going on longer than he originally thought. At this point, it is up to the Bennet’s and the townspeople of Hertforshire to defend themselves against the horde of zombies. One of the few problems I had with this novel is everyone that is introduced conveniently dies or disappears by the end. The list includes, but not limited to: Dr. Keckilpenny, Capt. Cannon, Lt. Tindall, Master Hawksworth, and Lord Lumpley. Overall, this prequel does not live up to the caliber of Pride and Prejudice and Zombies in character development, plot lines, and lots of plot holes. My opinions of these characters are a little crass, they are half assed. It’s not till the very end the when their personalities are revealed to audience. However, it’s done quickly at the end to try and tie everything up. Instead, though I found it to be more confusing than helpful to my understanding of the plot. What is the complete story between Mrs. Bennet and Capt. Cannon? What was Mrs. Bennet’s opinion of their relationship? I need to know more! *hint hint* a prequel for a prequel. After the big reveals about Master Hawksworth and Dr. Keckilpenny, I was just scratching my head. I’m not sure how I feel about Elizabeth’s romantic interests. I really did not feel any romantic tension between her and them a lot. I felt some tension between her and Master Hawksworth, but I felt like it was untapped potential. After reading it, Dr. Keckilpenny and Elizabeth had more of a friendship, they had very little romantic connection with each other. At the end of Dr. Keckilpenny time in the book, Hockensmith attempts to convince his readers Elizabeth and Dr. Keckilpenny had a romantic connection with one another which is opposite of what he shows his audience throughout the book. If you ignore the flaws of the book, it is an enjoyable mindless read. Dawn of the Dreadfuls is a particularly good read around Halloween. The best time to read this though is when you’re in the zombie mood, drop the brains and grab this book! Dang it! After writing out this review, I probably need to revisit my GoodReads account to gives this book a star lower than I did before.